Marine ecology, survey and monitoring blog. The views here are my own. ← Lyme Bay Closed Area Monitoring: what we have learned so far. One of Marine Bio-images’ areas of expertise is Marine Habitat Mapping. We have undertaken a great many mapping studies in the past 20 years, these include biotope mapping of the isle of Scilly sublittoral soft sediments, biotope mapping of the littoral and sublittoral habitats of the Dornoch Firth, biotope mapping of Plymouth Sound soft sediment and reef areas, habitat mapping within Lyme Bay, and habitat mapping of the sublittoral within Lamlash Bay No-take Zone (Isle of Arran). We use a variety of techniques, depending on depth, turbidity and the size and scale of the features to be mapped. We have particular expertise in combining drop-down and towed camera systems with diver spot surveys. This technique is highly cost-effective, providing a wide coverage (using camera systems) along with very detailed data collected by divers. 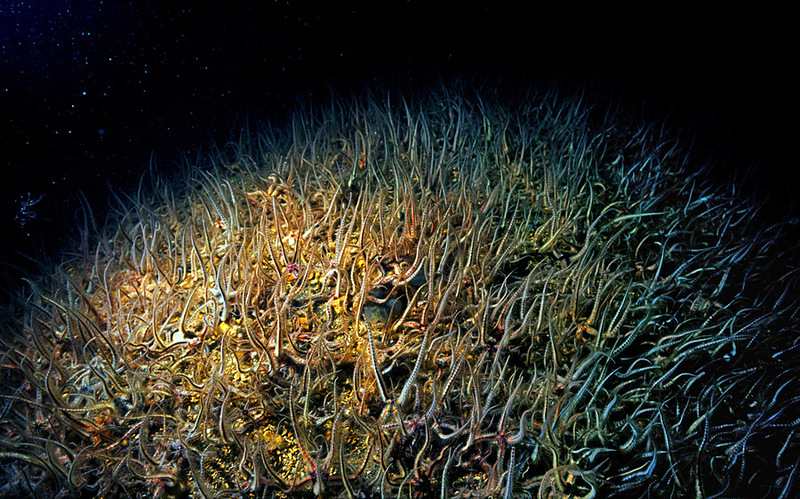 Dense bed of brittlestars (Ophiothrix fragilis), Lyme Bay, Southwest England, UK. Dense aggregations of brittlestars are a distinctive feature of lyme Bay. We also use acoustic techniques, including side scan sonar, to provide detail on the seabed releif and likley sediment type. For soft sediment areas we will ground truth this by grab sampling. Habitats are subsequently mapped using GIS to produce detailed geo-referenced habitat maps for the features of interest. This entry was posted in Seabed survey and monitoring and tagged colin munro, Exeter, GIS mapping, marine bio-images, marine biotope mapping, marine biotope mapping services, Marine habitat mapping, marine habitat mapping services. Bookmark the permalink. How to buy bad science.